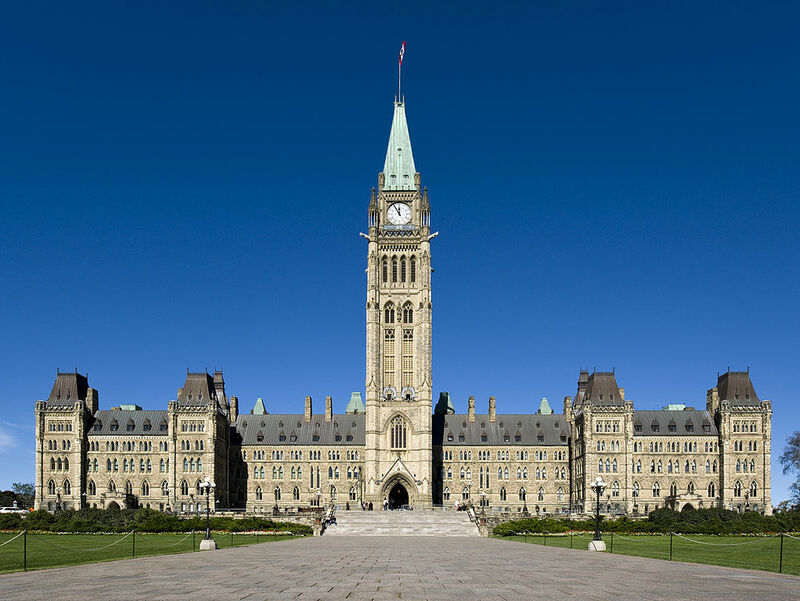 It’s a Canadian icon: the tall, stately Peace Tower rising above the Centre Block of Parliament in Ottawa, Canada. 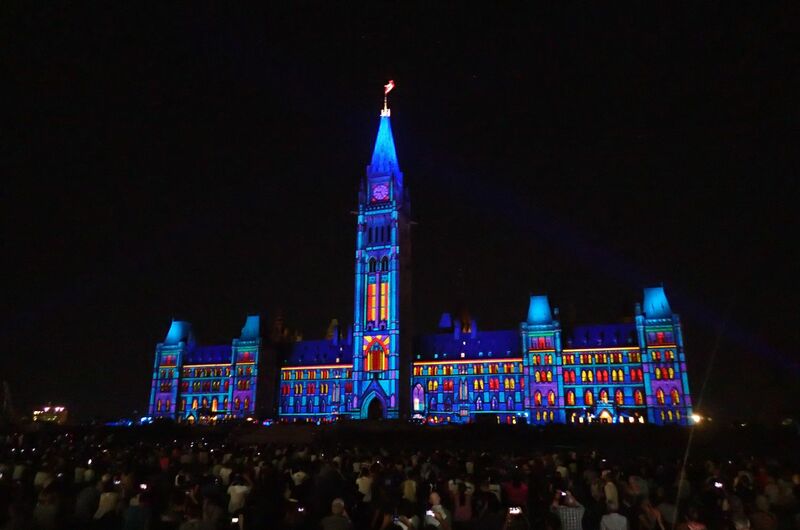 The Peace Tower has stood sentinel over the nation’s capital, serving as a silent witness to the workings of government, since it was inaugurated on July 1, 1927. But there’s much more to this striking structure than first glance reveals. Below are 12 behind-the-scenes facts about this distinctive symbol of Canadian nationhood. 1. The Peace Tower is 92.5 metres (302.5 feet), or 28 stories, tall (measured from the ground to the base of the flagpole). To get to the very top, you’d have to take an elevator 60 metres (200 feet) up to the observation deck below the clock, climb 10 stories of stairs and ladders, then open a hatch below the flagpole. Only a select few Parliamentary staffers are permitted to ascend beyond the observation deck. 2. The Peace Tower is the second such tower to stand on this site. 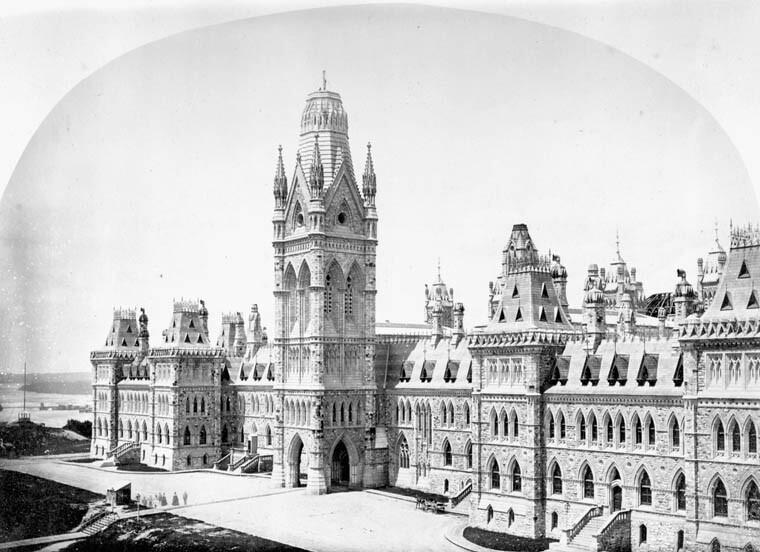 The first – the 60-metre (200-foot) tall Victoria Tower, completed in 1878 – crumbled to the ground during a fire that destroyed the original Centre Block building in 1916. 3. The Peace Tower is dedicated to the more than 65,000 Canadian soldiers who lost their lives in World War I. Behind the large stained glass windows directly above the arched entry porch is a room called the Memorial Chamber, home to altars and books of remembrance commemorating all Canadians who have given their lives in military service. The floor of the Memorial Chamber contains stones collected from battlefields in England, France and Belgium. 4. The Peace Tower is a free-standing bell tower, called a campanile. It is a completely separate structure from the Centre Block. The two buildings are connected via a short covered passageway. 5. The Peace Tower houses a 53-bell carillon, one of the oldest and finest in North America. Each bell is a different size: the smallest weighs 10 pounds (4.5 kilograms) and the largest – which tolls the hour – weighs 22,244 pounds (10,090 kilograms), about the size of three large elephants. The carillon is operated by the Dominion Carillonneur, who sits in a room mid-way up the tower and plays a keyboard connected to each bell clapper. 6. The flag atop the Peace Tower is changed every weekday, except on holidays and in inclement weather. This job is handled by the Flag Master, who raises and lowers about 250 flags on the Peace Tower flagpole each year. The flag is also changed whenever it is flown at half mast. 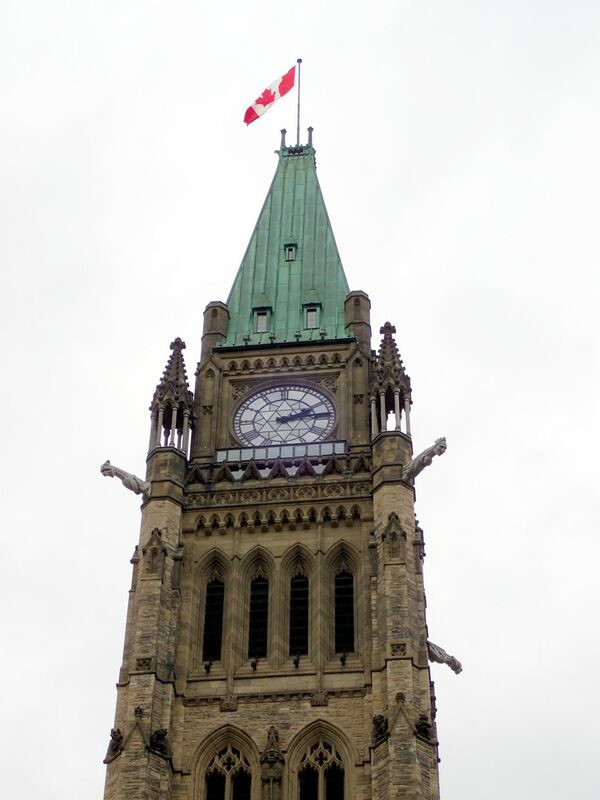 Canadians can request a flag flown from the Peace Tower, but the waiting period as of May 2018 was 99 years. 7. 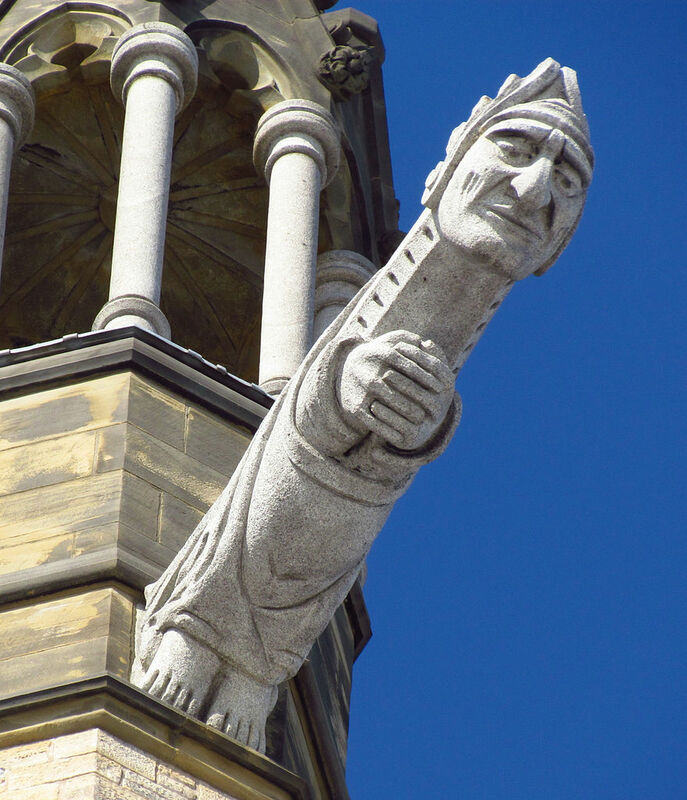 The hands of the Peace Tower clock cannot be turned backwards. The clock was built in 1927 and uses old mechanisms. At 2 a.m. every autumn, when Daylight Savings Time ends, the clock is stopped for a full hour to account for the time change. 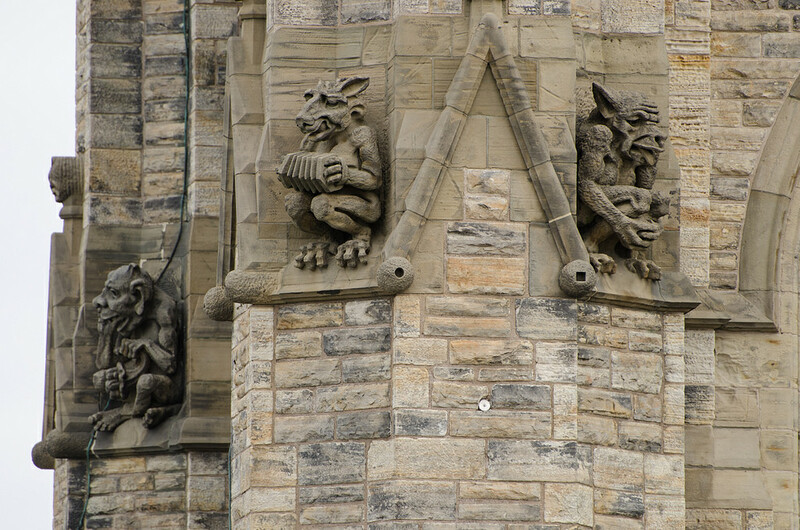 gargoyles – or decorative waterspouts – four of which project from the upper section of the tower, just below the clock. grotesques – or fantastical animal or humans figures, often with strange or distorted features – peering out from corners, nooks, walls and borders. bosses – or ornamental block carvings – gracing the ends and edges of window mouldings and arches. friezes – or sandstone panels featuring raised relief sculpture – found on flat surfaces of the building. symbols of heraldry — or figures holding shields of arms — adorning the main (south) entrance. 9. The elevator to the observation deck, located one story below the clock, runs on a 10 percent incline for the first 30 metres (98 feet) of its journey, covering a horizontal distance of 3.7 metres (12.2 feet) – but you’d never know it, as the car remains level at all times. From the large windows of the observation deck — 60 metres (200 feet) above the ground — you can enjoy a 360-degree view of the surrounding area, then gaze up at a massive clock face measuring 4.8 metres (16 feet) in diameter. Visit the observation deck on a Parliamentary tour. 10. 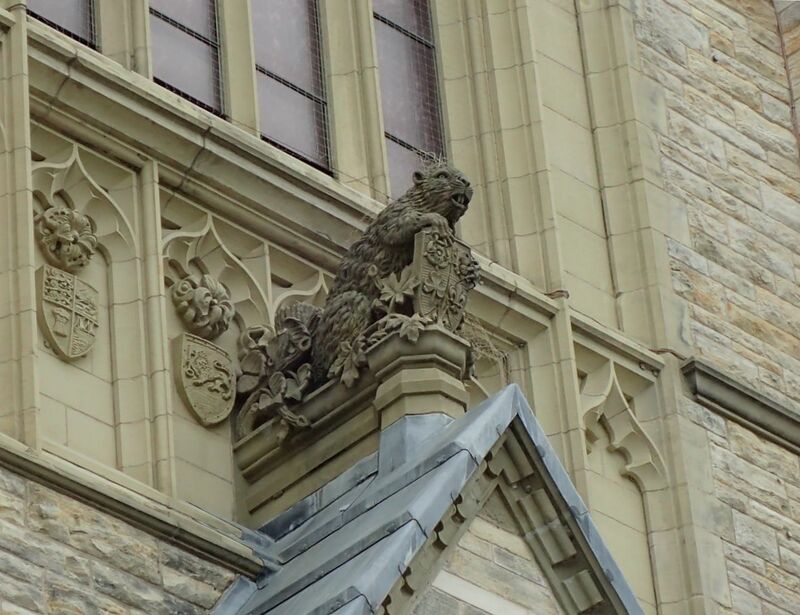 Four gargoyles, or carved stone waterspouts, stretch out like short arms from the upper section of the Peace Tower, just below the clock. Each gargoyle measures 2.5 metres (8.3 feet) long, 0.75 metres (2.5 feet) high and 0.45 metres (1.5 feet) thick. 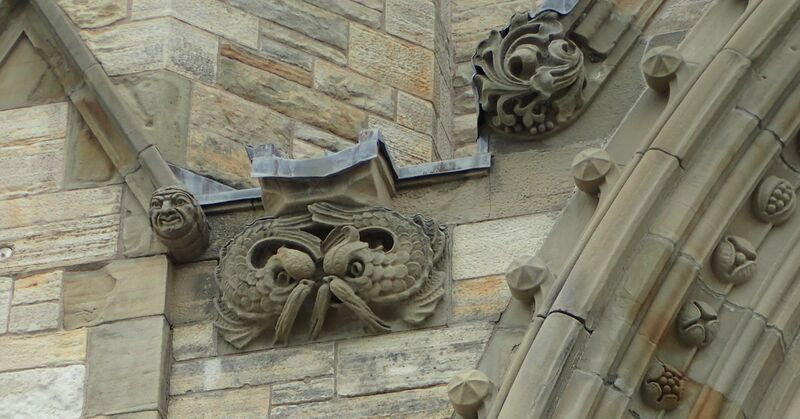 The gargoyles are carved from Quebec granite and are strictly decorative; they do not funnel water from the tower roof. 11. 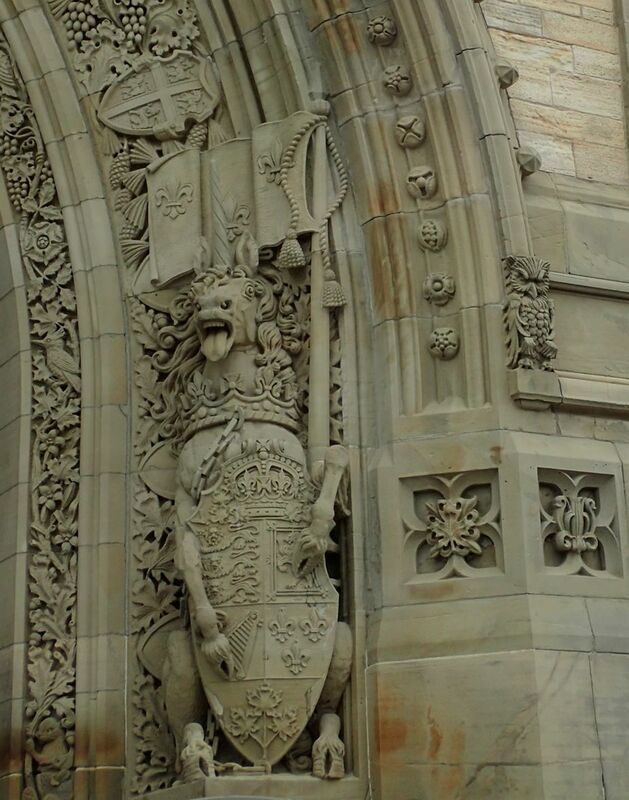 The exterior walls of the Peace Tower are made from cream-coloured sandstone quarried in Nepean, Ontario, about 16 kilometres (10 miles) west of Parliament Hill. The same type of sandstone was also used to build the Centre, East and West Blocks. Look for a natural outcropping of Nepean sandstone alongside Highway 417, at the high-point of land just east of Kanata. 12. The Peace Tower, together with the Centre Block, is one of the finest examples of Modern Gothic Revival architecture in Canada. Both buildings were designed by Toronto-based architect John A. Pearson and Montreal-based architect Jean-Omer Marchand in 1916. 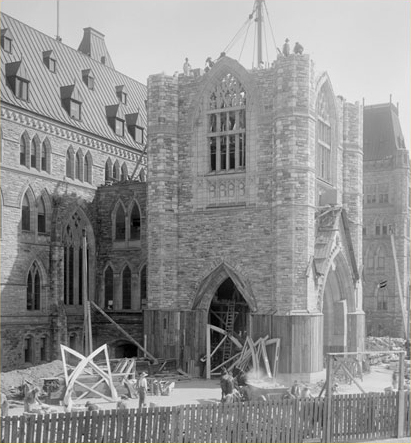 The Peace Tower was inaugurated on July 1, 1927, on the 60th anniversary of Canadian Confederation. For more information about the Peace Tower, visit Government of Canada – Explore the Peace Tower. In all my thoughts of the tower, peace was dominant. I believe there is a quiet peaceful dignity about it….no matter what troubles and worries and differences of opinion take place in the building. I feel that one cannot approach the building up the centre road without experiencing its mute appeal for toleration, moderation, dignity and peace. ~ John A. Pearson, architect responsible for designing the Centre Block, in a letter to Prime Minister Mackenzie King shortly before the opening of the Peace Tower. Connaught Hill Park – What can I see from up here?